The Eastern Massasauga (Sistrurus catenatus catenatus) is a small rattlesnake, typically measuring less than 30 in (760 mm) adult size (maximum length 39.5 in or 1003 mm). While this species is generally mild-mannered, it is venomous and will bite if provoked. NOTE: Never handle snakes unless you are positive about identification and are an experienced amateur or professional. Most bites result from intentional provocation and molestation of the snakes. Bites are typically not fatal but immediate medical attention should be sought. This beautiful species is listed as a federal candidate by the United States Fish & Wildlife Service and protected as a species of concern, threatened, or endangered in every state where it occurs. The Eastern Massasauga has declined significantly throughout its historical range and is heading towards extinction by the continued destruction and fragmentation of habitats, poaching for the illegal pet trade, and outright persecution from humans. Change of Eastern Massasauga wetlands and upland foraging areas from early-successional, or emergent (grassy), habitats into less suitable shrub or forested habitats is also a significant threat, even at protected sites not actively managed for the species. Eastern Massasauga habitats are widely scattered and fragmented from southeastern Ontario, west-central New York, and western Pennsylvania, west to western Wisconsin, eastern Iowa, and northeastern Missouri. The snakes overwinter in underground voids, burrowing crayfish burrows, and tunnels that reach into flowing groundwater in or near wetlands such as fens, wet meadows, and swamps. Occasionally, Eastern Massasaugas will overwinter in stream bank cracks, old tile drains, and holes in open woods that reach the water table. Eastern Massasaugas also require upland habitats during the active season for foraging, basking, and gestation. These upland habitats typically consist of meadows, old fields, and shrub lands. In certain areas of the Great Lakes region, particularly Michigan and Ontario, Eastern Massasaugas will utilize rocky openings and clearings in wooded areas. Prior to European colonization, these wetlands extended across dynamic landscapes that contained early successional habitats kept open by Native Americans, wildlife (bison, beaver, and elk), and other natural factors (such as fire, soil chemistry and stable plant communities). Disjunct Eastern Massasauga sites also occur throughout the range of the species, and many of these areas were most likely isolated due to natural landscape-level habitat changes through the previous millennia. In Pennsylvania (one of two states within our focus area that contain Eastern Massasauga populations), the range of the Eastern Massasauga has shrunk considerably from habitat destruction and fragmentation and the species may be close to extirpation. Historically, the Eastern Massasauga was largely ignored or mismanaged due to the wide-spread perception of venomous snakes as bad and the absence of successful land protection programs. But good news has come for the Eastern Massasauga in recent years. The Pennsylvania Fish & Boat Commission (the state regulatory body in charge of amphibians and reptiles) has prioritized the species as a high-priority species of greatest conservation need and is creating conservation and research initiatives focused the Eastern Massasauga. The best hope for Eastern Massasauga stabilization is the Natural Resources Conservation Service’s (an agency of the U.S. Department of Agriculture) Wetlands Reserve Program. This program is designed to protect Eastern Massasauga habitats and wetlands in general through conservation easements and provides funds for habitat restoration. 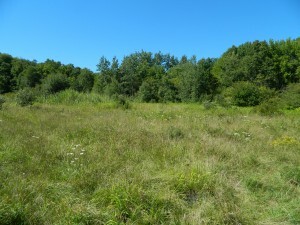 Click here to visit the Pennsylvania Natural Resources Conservation service Wetlands reserve Program website (Link to NRCS Bog Turtle and Eastern Massasauga Wetlands Reserve Program: http://www.nrcs.usda.gov/wps/portal/nrcs/main/pa/programs/easements/wetlands/). This figure represents the Eastern Massasauga Range in Pennsylvania through time (via Howard Reinert). Why should we protect the Eastern Massasauga? The arguments for the protection of the Eastern Massasauga are very similar to the Bog Turtle. Valid arguments for the preservation of this species include the idea that all organisms have intrinsic value and have a right to exist. Many people find personal pleasure and enjoyment in seeing Eastern Massasaugas and wetlands, and simply knowing that they exist. And numerous well-demonstrated reasons exist for preserving biodiversity. We believe that Eastern Massasauga conservation is much bigger than an individual species, even as interesting and the Eastern Massasauga is. The Eastern Massasauga is a flagship species for wetland conservation and water quality, and is a part of our rural and agricultural heritage. Headwater wetlands fed by springs are essential for the Eastern Massasauga. Wetlands have been demonstrated to be extremely important for functional landscapes and provide many beneficial services to humans. These particular spring-fed wetlands provide clean, highly oxygenated water into our landscapes, essential for all aquatic organisms. The streams and rivers that we utilize for drinking water and for recreation begin in headwater Eastern Massasauga wetlands. People from all walks of life, from the trout fisherman to those that simply prefer drinking clean water, should be Eastern Massasauga advocates. 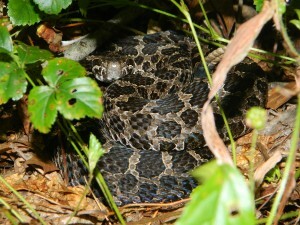 Additionally, Eastern Massasauga wetlands and upland habitats are utilized by a number of game species including waterfowl, woodcock, and white-tailed deer. If we lose the Eastern Massasauga to extinction we will have also lost our rural heritage and jeopardized basic necessities like a cool, clean glass of water. Please help the Mid-Atlantic Center for Herpetology and Conservation and our partners protect the important species like the imperiled Eastern Massasauga. Figure: Succession is a significant threat to Eastern Massasauga colonies and other early successional species (figure via Howard Reinert). How does the Mid-Atlantic Center for Herpetology and Conservation help the Eastern Massasauga? By re-investigating portions of the historical range. The Mid-Atlantic Center for Herpetology and Conservation has identified a number of historical sites that may still harbor this species. Our expert staff and Pennsylvania Fish & Boat Commission are conducting surveys in an attempt to find extant colonies in Pennsylvania. By facilitating the preservation of Eastern Massasauga habitats. The Mid-Atlantic Center for Herpetology and Conservation is aids the Natural Resources Conservation Service and the Pennsylvania Fish & Boat Commission by promoting conservation easements to interested landowners. The Wetlands Reserve Program is the most powerful tool available for Eastern Massasauga landscape protection and provides landowners with competitive compensation packages in Pennsylvania. By turning back the hands of time. Without the historical forces that kept Eastern Massasauga habitats open, meadows and emergent wetlands are changing into unsuitable forested wetlands. 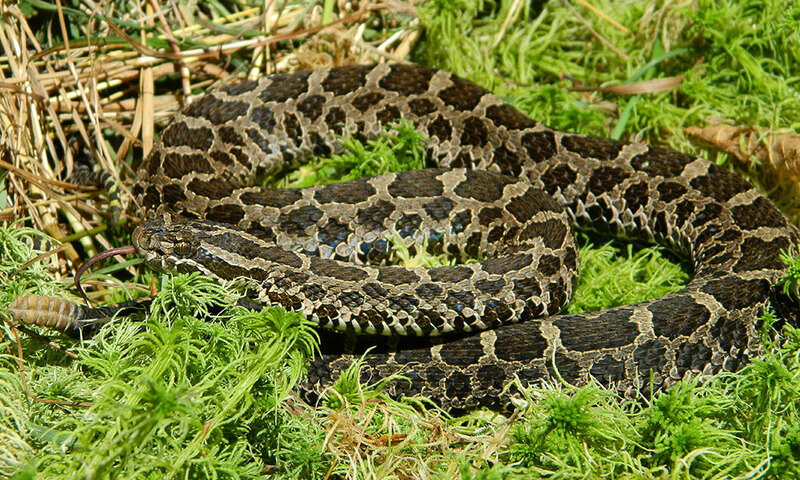 The Mid-Atlantic Center for Herpetology and Conservation creates habitat restoration plans and conducts habitat restoration for the Eastern Massasauga in Pennsylvania. The Mid-Atlantic Center for Herpetology and Conservation has partnered with several organizations and agencies to advance the knowledge and protection of the threatened Bog Turtle. Key partners are listed below. The NRCS has a launched an Eastern Massasauga Wetlands Reserve Program (WRP), the best conservation option for the Eastern Massasauga and landowners to date in Pennsylvania. As part of a joint project with the Pennsylvania Fish & Boat Commission, The Mid-Atlantic Center for Herpetology and Conservation aids landowners within Eastern Massasauga range seeking WRP conservation easements that provide compensation.